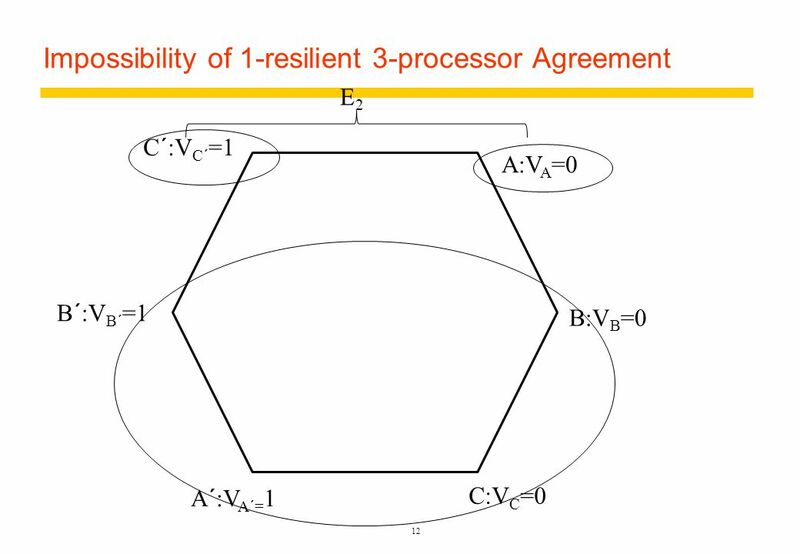 DISTRIBUTED SYSTEMS II FAULT-TOLERANT AGREEMENT Prof Philippas Tsigas Distributed Computing and Systems Research Group. 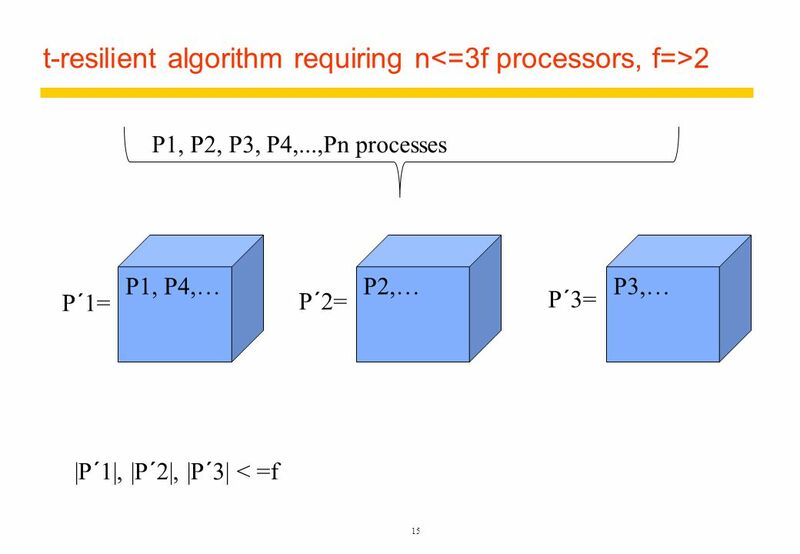 16 t-resilient algorithm requiring n 2 16 P1, P4,…P2,…P3,… P1, P2, P3, P4,...,Pn processes P´1= P´2= P´3= In the system with 3 processors (P´1, P´2 and P´3) if one is faulty at f most of the initial system processes are going to be faulty. 20 Proof of Correctness Proof by contradiction. 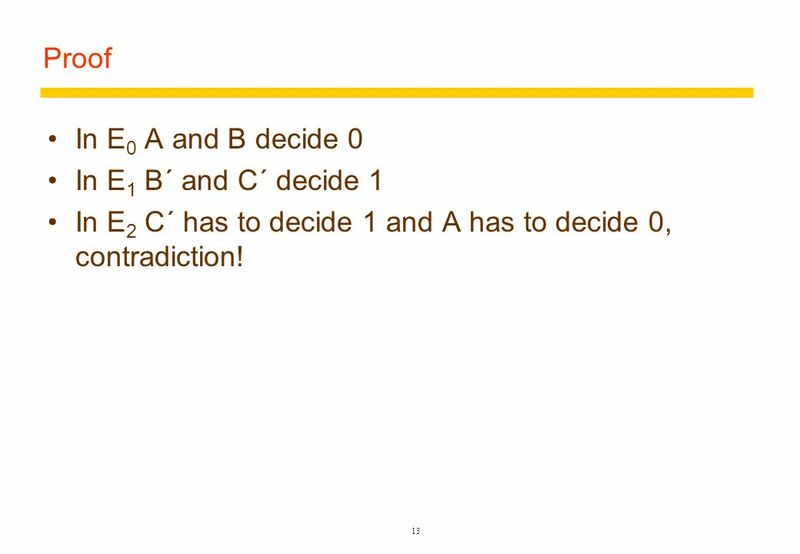  Assume that two processes differ in their final set of values.  Assume that p i possesses a value v that p j does not possess.  A third process, p k, sent v to p i, and crashed before sending v to p j. 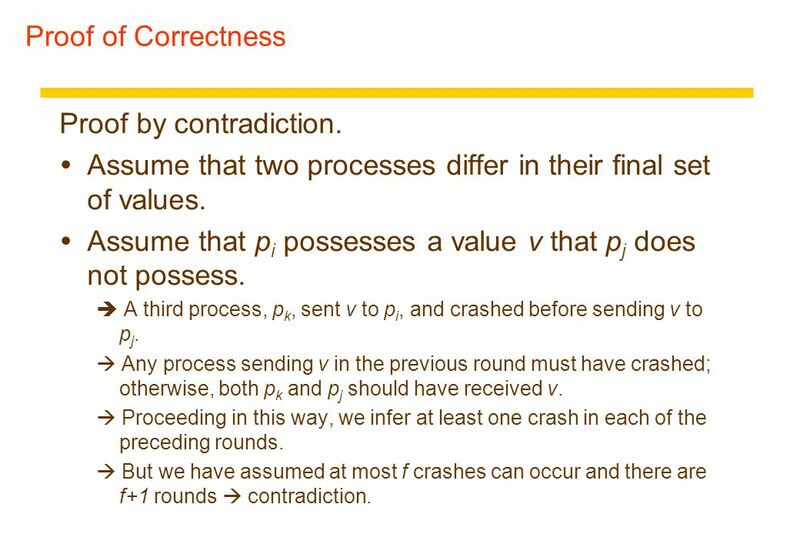  Any process sending v in the previous round must have crashed; otherwise, both p k and p j should have received v.  Proceeding in this way, we infer at least one crash in each of the preceding rounds.  But we have assumed at most f crashes can occur and there are f+1 rounds  contradiction. 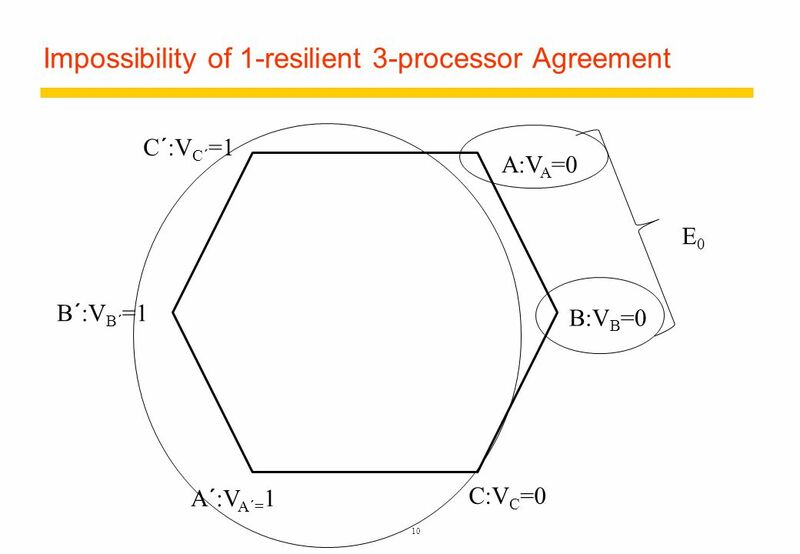 Download ppt "DISTRIBUTED SYSTEMS II FAULT-TOLERANT AGREEMENT Prof Philippas Tsigas Distributed Computing and Systems Research Group." 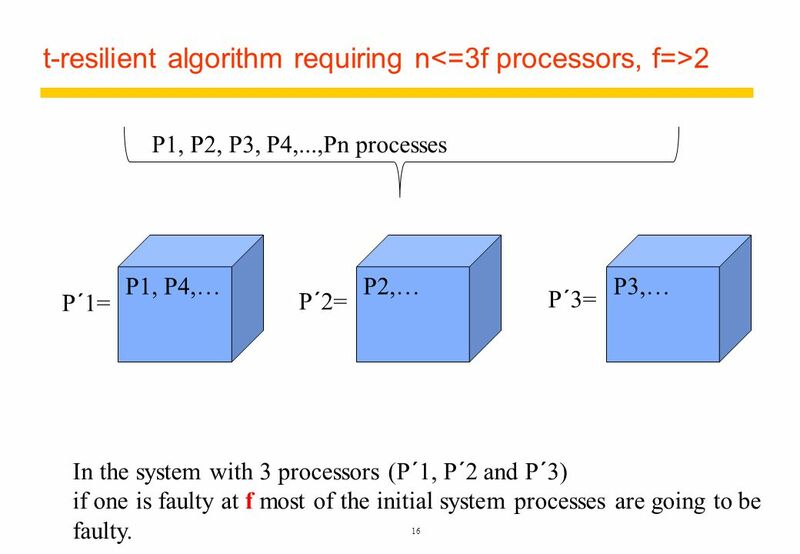 Fault Tolerance. 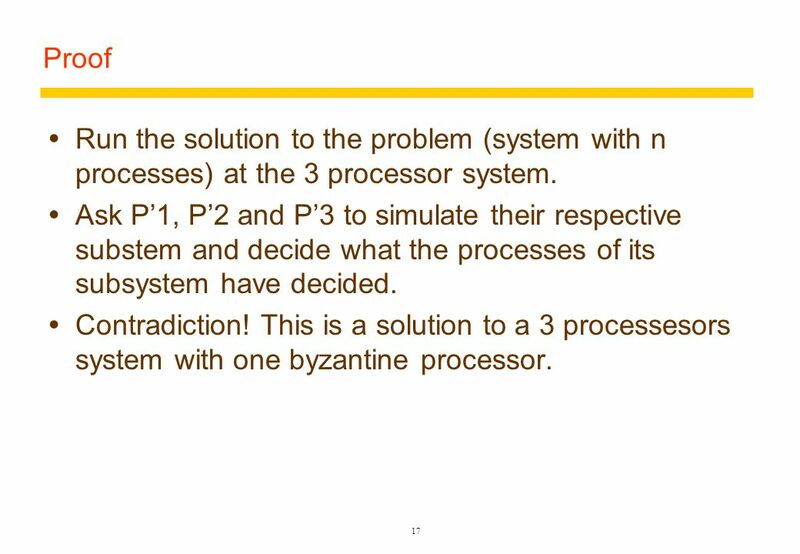 Basic System Concept Basic Definitions Failure: deviation of a system from behaviour described in its specification. Error: part of. 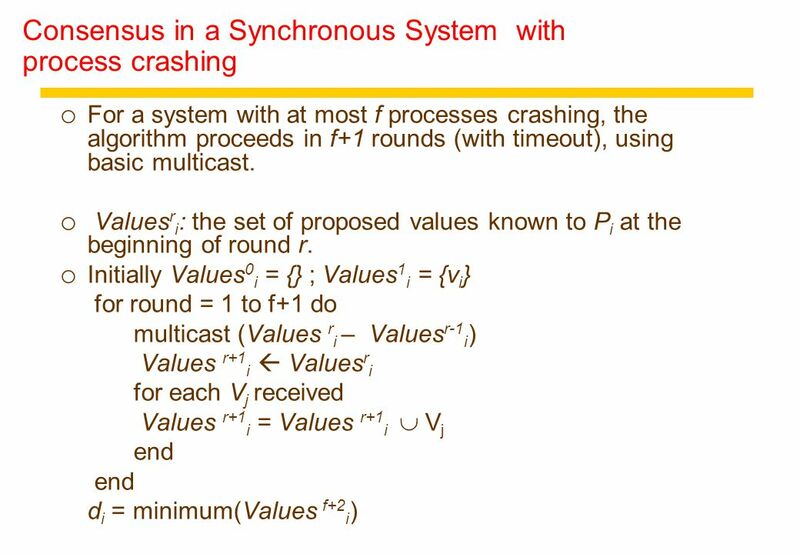 DISTRIBUTED SYSTEMS II FAULT-TOLERANT BROADCAST Prof Philippas Tsigas Distributed Computing and Systems Research Group. 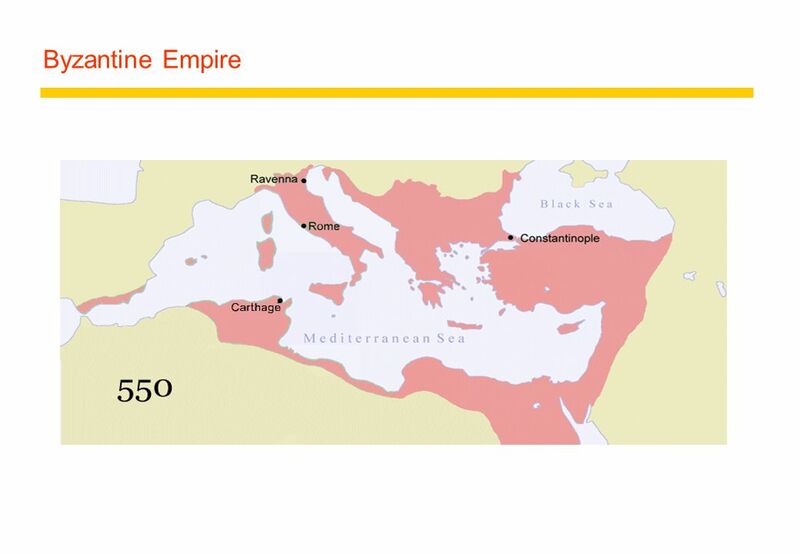 Byzantine Generals. 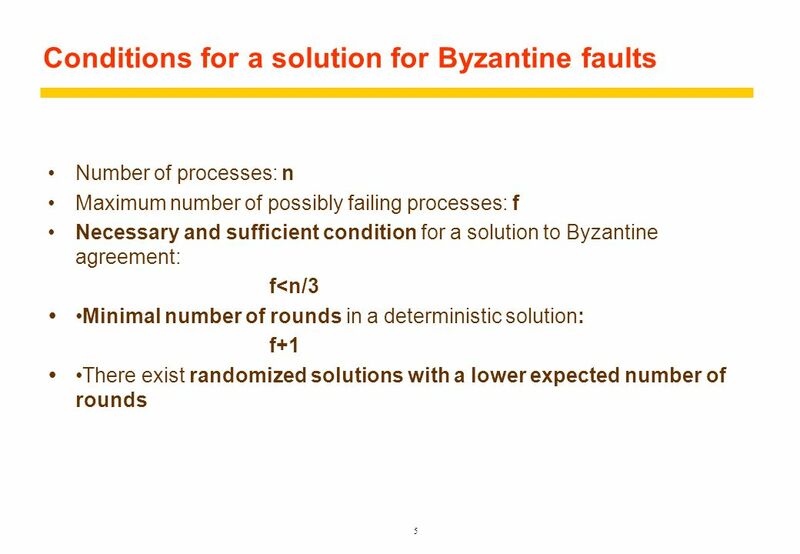 Outline r Byzantine generals problem. 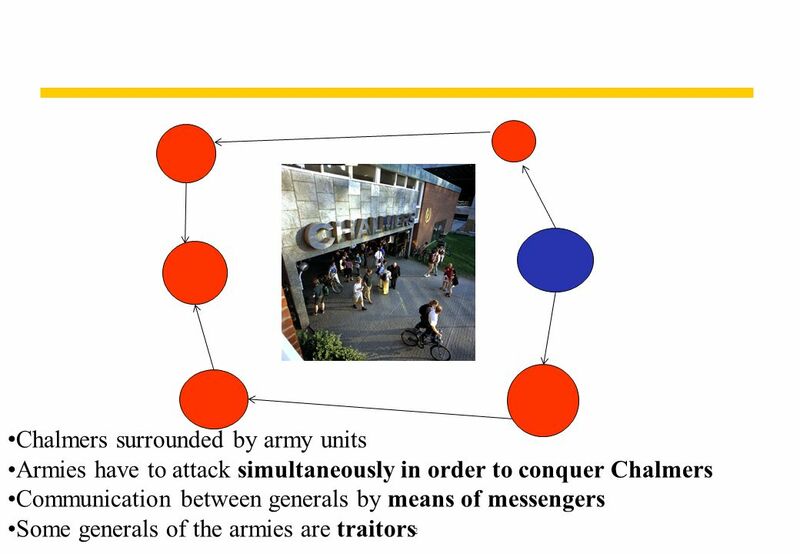 The Byzantine Generals Problem Leslie Lamport, Robert Shostak and Marshall Pease Presenter: Phyo Thiha Date: 4/1/2008. 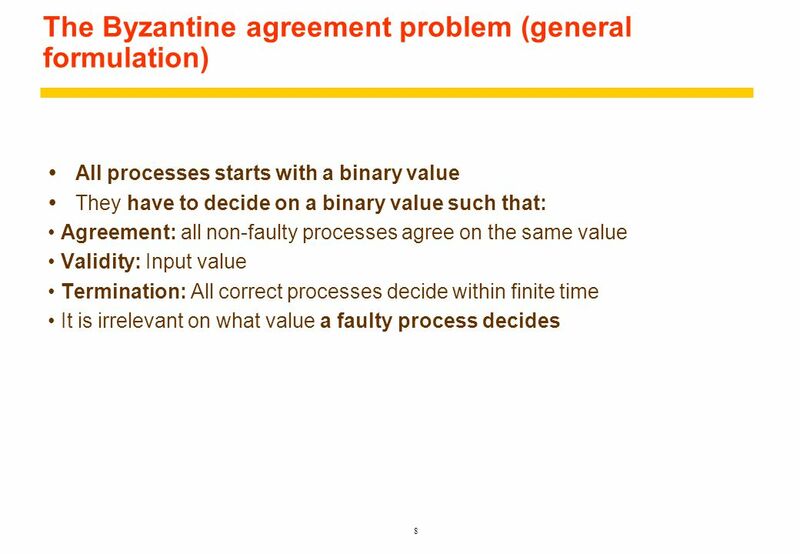 Agreement: Byzantine Generals UNIVERSITY of WISCONSIN-MADISON Computer Sciences Department CS 739 Distributed Systems Andrea C. Arpaci-Dusseau Paper: “The. 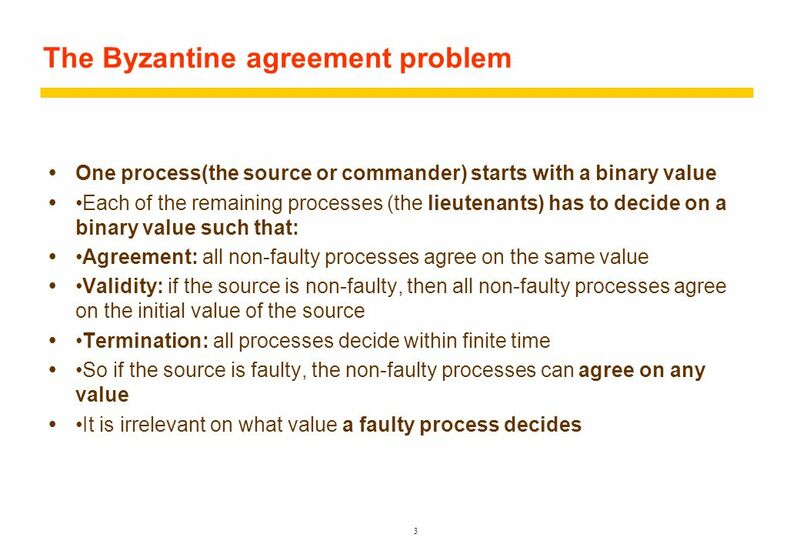 The Byzantine Generals Problem Boon Thau Loo CS294-4. 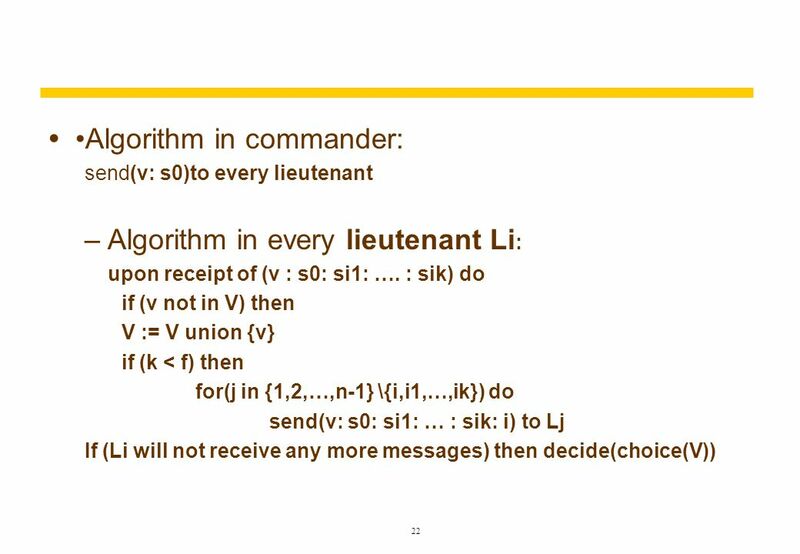 The Byzantine Generals Problem Leslie Lamport, Robert Shostak, Marshall Pease Distributed Algorithms A1 Presented by: Anna Bendersky. 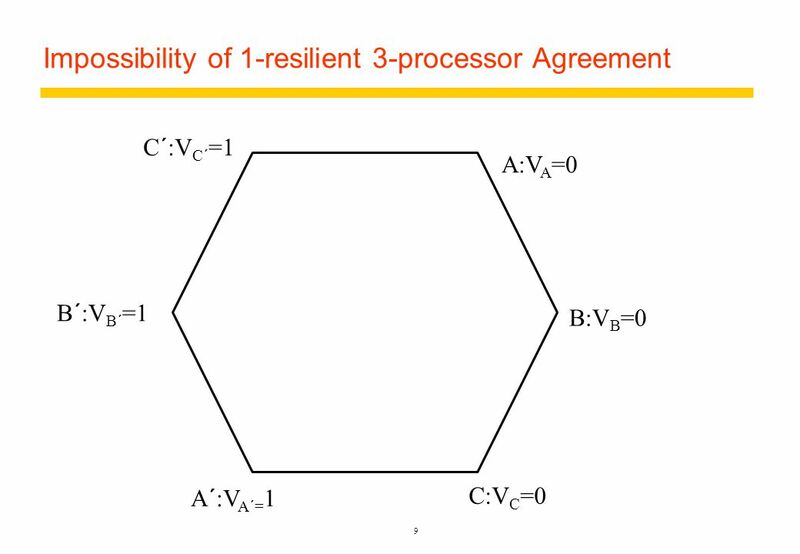 Achieving Byzantine Agreement and Broadcast against Rational Adversaries Adam Groce Aishwarya Thiruvengadam Ateeq Sharfuddin CMSC 858F: Algorithmic Game. Prepared by Ilya Kolchinsky.  n generals, communicating through messengers  some of the generals (up to m) might be traitors  all loyal generals should. 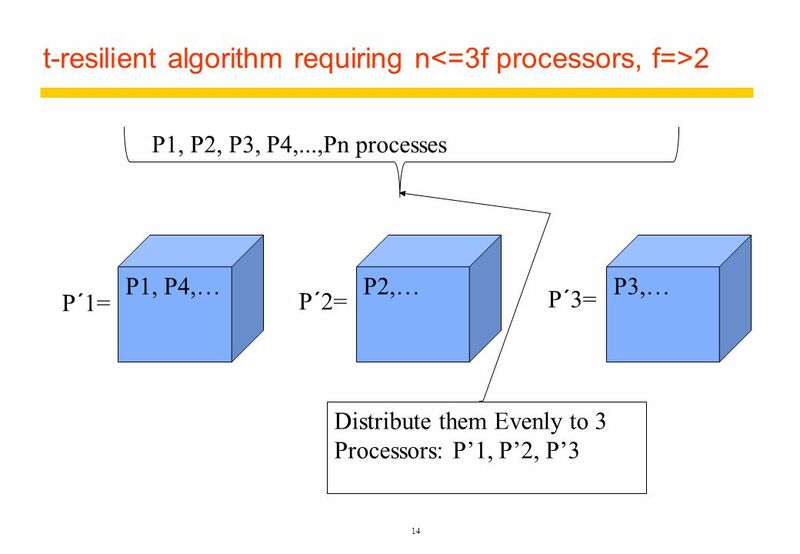 CSE 486/586, Spring 2012 CSE 486/586 Distributed Systems Byzantine Fault Tolerance Steve Ko Computer Sciences and Engineering University at Buffalo. 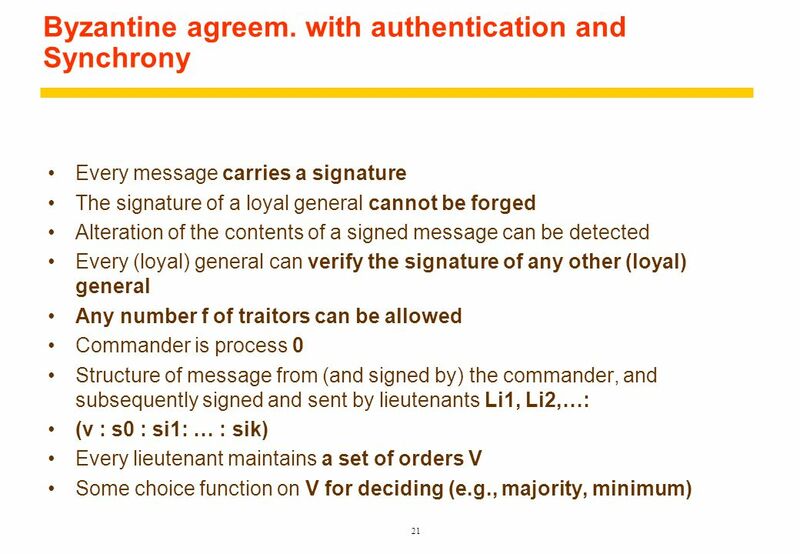 Byzantine Generals Problem: Solution using signed messages. Byzantine Generals Problem Anthony Soo Kaim Ryan Chu Stephen Wu. 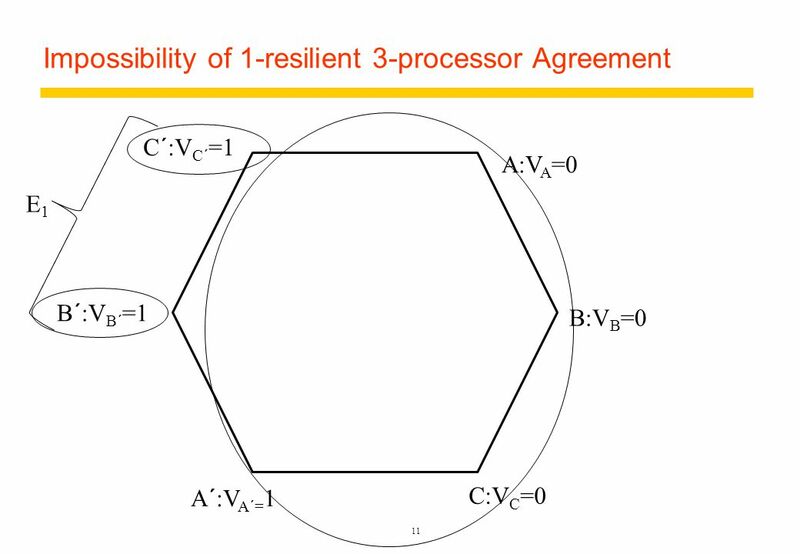 CPSC 668Set 9: Fault Tolerant Consensus1 CPSC 668 Distributed Algorithms and Systems Fall 2006 Prof. Jennifer Welch. Copyright 2006 Koren & Krishna ECE655/ByzGen.1 UNIVERSITY OF MASSACHUSETTS Dept. of Electrical & Computer Engineering Fault Tolerant Computing ECE 655. 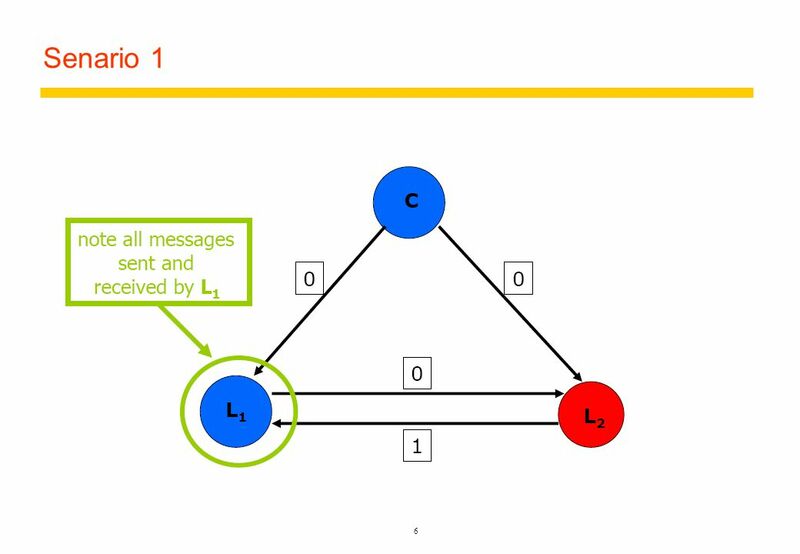 CPSC 668Set 9: Fault Tolerant Consensus1 CPSC 668 Distributed Algorithms and Systems Spring 2008 Prof. Jennifer Welch. Computer Science Lecture 17, page 1 CS677: Distributed OS Last Class: Fault Tolerance Basic concepts and failure models Failure masking using redundancy. EEC 693/793 Special Topics in Electrical Engineering Secure and Dependable Computing Lecture 15 Wenbing Zhao Department of Electrical and Computer Engineering.